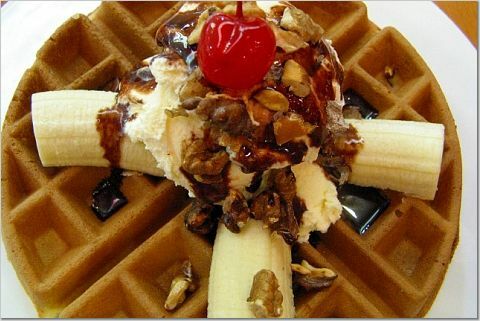 Waffles is something that i always have a passion in … a shopping trip in one utama has indirectly brought me to this Waffle World to get a try …. However, they ran out of the fried seafood pasta (some chef recommendation), so I ordered a mix of American hotdog (RM4), Fish and chips (RM14.90), Fettucine carbonara (RM10.30) and of course, Banana walnut waffles (RM6.80) ! all of which are supposedly nice/popular, according to waiter’s recommendations. Hmm… hot dog is normal and no big deal. Fish and chips is reasonable portion and fish batter does taste of old oil, meaty. Pasta was mediocre and non-meat. Possibly i’m a meat eater, thus these “vegtarian pasta somehow doesn’t taste right for me ! Besidea, there wasn’t enough sauce, thus too dry. You are currently browsing the Yummy Corner weblog archives for November, 2005.